In the recent past, I’ve written few touch typing tutors that can be used in Ubuntu Linux such as; The awesome Klavaro, TIPP10, Ktouch and dvorak7min (a special one, optimized for the Dvorak keyboard layout), nlkt and Typespeed (a typing game). But, since adding another one wouldn’t have hurt ;-), plus I think most do know about it already because it’s the official touch typing tutor of the GNU project, if you haven’t heard about it then it is known as the “gtypist” (GNU Typist). It’s a command-line tool, but uses the “curses” library thus, as you can see from the below screenshot, it’s a really user friendly application. It’s quite powerful too, supports few languages, few keyboard layouts and has dedicated lessons for special keys etc. But, like many other tools, it too won’t let you move on to the next lesson, if you have an error rate of 3% or more. But that can be easily changed nonetheless (more at the end). *. Supports QWERTY, Dvorak and Colemak keyboard layouts (with lessons optimized for each layout, from home raw key tutorials to long paragraphs, Shift key practice, a list of 150 frequent words test, letter typing etc). *. Languages supported: English, Russian, Spanish, Germen, French, Norwegian and Czech. *. Special lessons for improving the typing speed including the numeric keypad (keys). *. Shows your “Raw” and average speed (WPM) and error rate at the end of each lesson. *. If you use the QWERTY (the most popular layout), then it has few more additional lessons. *. You can use the arrow keys to move around in the menus and “Esc” for going back (also for exiting a lesson or the program itself). If interested, you can install “gtypist” in Ubuntu 12.04 Precise Pangolin, 11.10 Oneiric Ocelot, 11.04 Natty Narwhal, 10.10 and 10.04 by using the below command in your Terminal window. Whenever you want to launch it, put the below command in your Terminal window. As said before, the default error rate is “3%” and if you usually end up going a bit beyond that while typing (no pressure!, no pressure! !, kidding ;-)) then it won’t let you go to the next lesson. But you can manually adjust the error rate by using the below command when launching it. Just replace “7” with your preferred error rate. That’s it!. 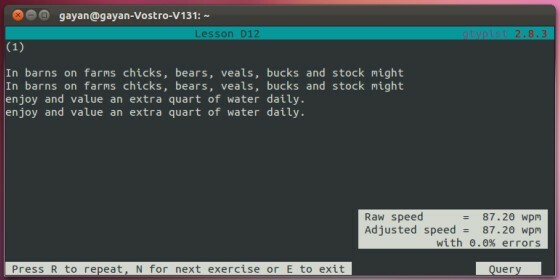 If you wouldn’t mind not having a fancy GUI, and looking for a powerful, lightweight and easy to use touch typing tutor that can be used in Ubuntu Linux, then the official GNU “gtypist” is a pretty awesome one without a doubt. Enjoy!.